We collect personal data from you when you provide such personal data to us, or via our services with which you interact. We may also obtain such other personal data about you as may be provided to us in the course of our legitimate business activities. Your full name; your address; your various email addresses; your various phone numbers including mobile phone numbers; your nationality; your address; financial information about you, including your bank account details, credit card details, or other payment details; details of contracts you have entered with third parties for us to provide services to you; details of your relationship to other parties; details of your membership of professional or other organisations; your date of birth; details of your children and other relations; medical details, including details of allergies; details of your car registration number; details of your driving licence; details of your passport and all other Data which you ask us to process on your behalf, or which is necessary for us to process in order for us to fulfil our role as providing accommodation, gym, leisure, retail or food related services to you; details of your location while on the property via keycards and security measures such as closed circuit television and personal body cameras (worn on employee uniform). As part of the registration process for our ezine, we collect personal information. We use that information for a couple of reasons: to provide you with information you have asked us to tell you about; to contact you if we need to obtain or provide additional information; to check our records are correct and to check every now and then that you are happy and satisfied. We do not rent or trade email lists with other organisations and businesses. Like most websites, we gather statistical and other analytical information collected on an aggregate basis of all visitors to our web site. This non-personal data comprises information that cannot be used to identify or contact you, for example, user IP addresses where they have been clipped or anonymised, browser types and other anonymous statistical data involving the use of our website. We may disclose your Data to third parties who provide a service to us or in the event that we sell or buy any business or assets, in which case we may disclose your Data to the prospective seller or buyer of such business or assets or if we are under a duty to disclose or share your Data in order to comply with any legal obligation, or to protect our rights, property, or safety of staff or customers. Currently, we disclose your Data to the following providers. We may disclose personal information to our third-party service providers who provide services such as wedding event suppliers, website hosting, data analysis, payment processing, order fulfillment, information technology and related infrastructure provision, email delivery, auditing and other services. When someone makes a booking, we use various third-party services listed below to record booking information and process payment. Information we collect may include, but is not limited to, personal information such as your name, email address, telephone number and stay preferences. This information is hosted securely on the servers of these third parties. We use this information primarily to fulfill your hotel, spa or restaurant booking. We also may send you pre and post stay communications via these third parties. When someone visits www.cafeparisienbelfast.com we use a third-party service, Google Analytics, to collect standard internet log information and details of visitor behaviour patterns. We do this to find out things such as the number of visitors to the various parts of the site. This information is only processed in a way which does not identify anyone. We do not make and do not allow Google to make, any attempt to find out the identities of those visiting our website. We use a third-party provider, MailChimp, to deliver ezines. We gather statistics around email opening and clicks using industry standard technologies to help us monitor and improve our ezines. For more information, please see MailChimp’s privacy notice. You can unsubscribe to ezines at any time of the day or night by clicking the unsubscribe link at the bottom of any of our emails or by emailing us at info@cafeparisienbelfast.com. 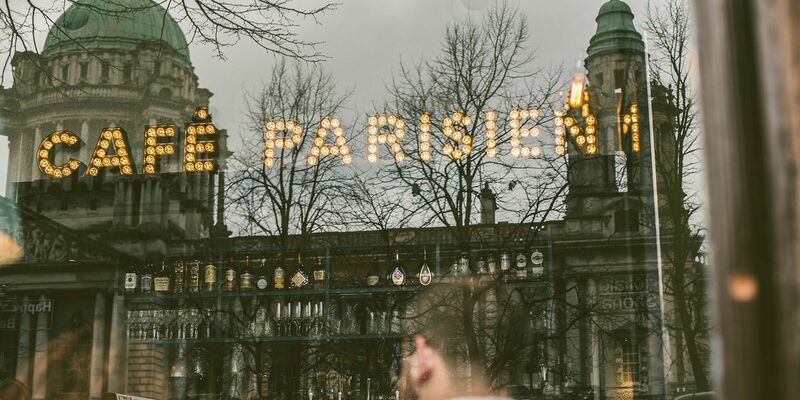 To find out what personal data we hold on you or to have your personal data updated, amended or removed from our database, please contact us info@cafeparisienbelfast.com. Any such data subject requests may be subject to the prescribed fee. We reserve the right to change this Policy from time to time at our sole discretion. If we make any changes, we will post those changes here so that you can see what information we gather, how we might use that information and in what circumstances we may disclose it. By continuing to use our site or our services or otherwise provide data after we post any such changes, you accept and agree to this Policy as modified. Policy last reviewed May 2018. We keep your personal data for so long as is reasonably necessary for the purpose for which we use it, in most cases for 1 -2 years but in certain circumstances, this may be for a shorter or longer period. If longer, for any duration required by law and for statutory claims limitation periods where your personal data may be relevant to any possible liability we may have. Questions, comments, requests and complaints regarding this Policy and the information we hold are welcome and should be addressed to us at info@cafeparisienbelfast.com. All requests will be dealt with promptly and efficiently. Café Parisien (Belfast) Limited located at Cleaver House, Donegall Square North, Belfast, BT1 5GA is a private company limited by shares registered in Northern Ireland, number NI646249. Registered office address: Murray House, Murray Street, Belfast, BT1 6DN. Let their palette be revived with authentic French classics, tempting crepes and patisserie delights, paired with delicious French wines in a unique Parisien ambiance.